It was about time as I found some things that had been in there way too long. That went into the compost pile and I moved on to what was usable. If the zip bags are full of too much frost the flowers are probably not good for much. I decided to do some jar dyes and a couple of steam prints on some silk jacquard I had sitting around. I like the way eco printing looks on a textured fabric (sometimes). My advice on saving stuff in the freezer would be to actually break the flowers apart and use containers or bags that allow you to expel extra air. This keeps the materials in good condition and takes up less room than trying to store whole flower heads. They won't print anyway, just help to dye the background of the fabric. First the jar dyes. Normally one would set these up and put them in a sunny window to pleasantly cook away over several months. Since there is little chance of that much sun at this time of the year in Spokane, when I finished them I set them in a bread pan on a heat register in the living room. Not terribly romantic, but it does help to be able to keep an eye on them. Sometimes this sort of thing gets a bit fizzy. The method for this is to layer the fabric and plant materials very densely and then pour some sort of liquid over the top and put on the lid. If you are going to process them in a boiling water bath you would want to use actual canning jars and keep pressing everything down as you fill the jar to get as much air out as possible or they will spew all over the canner and you will lose a lot of your liquid. I did it once and decided for my purposes it wasn't worth wasting the energy on it. The colors lost their vibrancy, the jars were still little bacteria farms and what color was achieved was just as fugitive as the jars that simply sat around for months with no cooking. I use this method to eco print on, so I thoroughly expect that the color achieved in the jars will change. It seems like a very long first step, but the results can be amazing. Think about the way things smell before doing this. If it is pungent to begin with, after a couple of months it could be horrifying. Take it from me, don't use seaweed or dried woad for this method. EVER. The jar on the left has in it what I call "Kim's Iris" as that is the friend that gave them to me. They are so purple they are almost black. There is also some dried tansy flowers and red tea in there as well. I poured boiling water over it to get some action going. 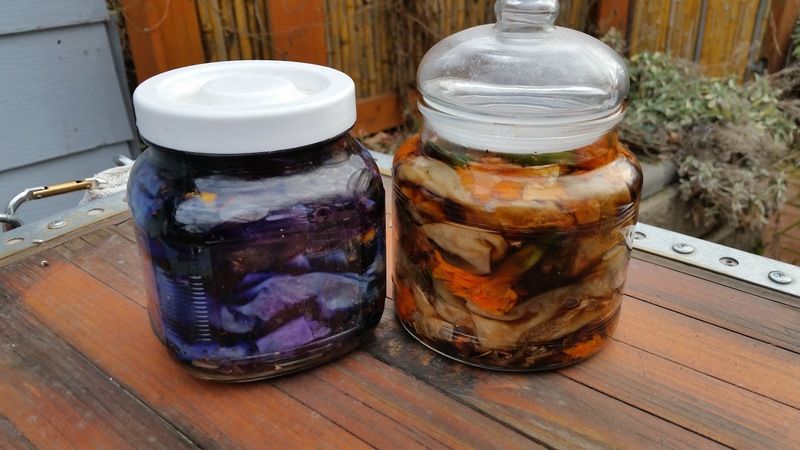 The second jar is marigold and onion skins with the remains of the morning coffee as the fluid. Both pieces of fabric were pretreated with rusted nails or steel wool, which also involves vinegar and salt, so that would be the pre-mordant. Hopefully, I will remember to show you what happened in a few months. The next post will be about actually using frozen stuff in an eco print. What does an Eco Printer do in the Winter?